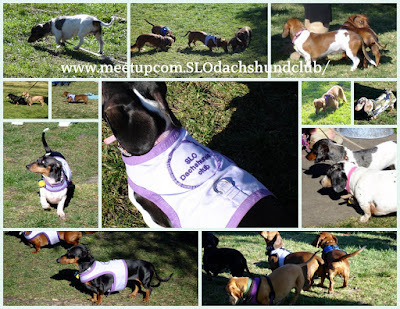 While shopping in San Luis Obispo today, we stumbled upon the SLO Dachshund Club's "Meet-Up" at Laguna Lake. They meet the first Sunday of each month at 1:00 pm at the group area in Laguna Lake. Today there were probably 35 "Weenie" dogs of all colors and sizes. This is just a sampling of some of the cutest weiner dogs around. These dogs were so friendly and got along so well. Most of them weren't even on leashes and some played with much larger dogs. You may already know that we have a little weenie, Oscar Mayer, but we had no idea this was going on each month. I can't wait to take little Oscar and his "cousin" Wilhelm there next month. Check out their website HERE. Then, while Wes was talking on the phone, I meandered the shoreline snapping pictures of incredible views. I sat down for about 10 minutes just letting it all wash over me and "take me away." At this point, we had been into a couple of stores and both of them had their radios up really loud and it was nice to just sit in silence.